This tutorial will guide you to make an audio clip for a movie in the simplest way with AV Music Morpher 4.0. Click on Morpher tab on the module bar to open AV Morpher. To open a single file, click File on the menu bar and choose Open. Open dialog box will come up, select an audio file you want to open. Or use Open from library, Add Files to Playlist buttons to add files to the playlist. Or click Add folder to Playlist to add a folder of files. Connect the other end of the cable with the headphone plug on your cassette player. 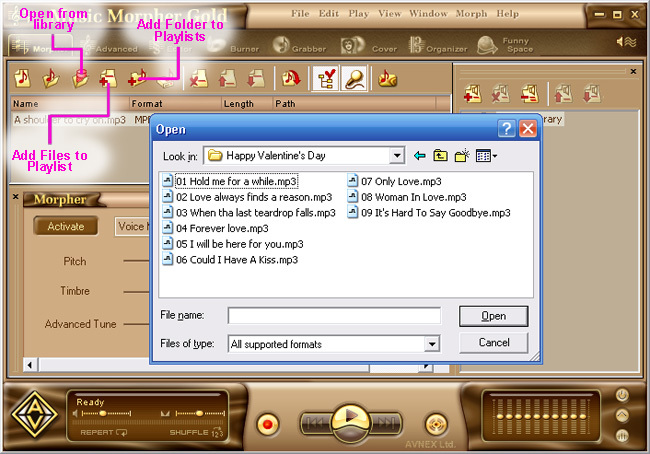 Press Morph Selected Files button on the Playlist toolbar. The Morphing dialog appears. 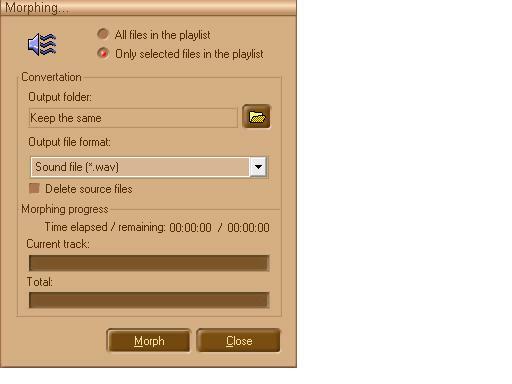 Select an Output Folder and MP3 File Format, then click Morph button to start the morphing process. Please note: before processing you are asked to select Sound Format. Just leave them as default by clicking OK button if you do not sure what to do. Any wrong selection in this step will cause the output quality worse as usual.